Energy efficiency is crucial to cutting the carbon pollution that’s fueling climate change. It will be better for our health, reduce consumer bills, boost the economy, and provide more jobs. Additionally, energy efficiency increases national security and improves the competitiveness of businesses. If that isn’t enough incentive, being efficient with our energy expenditure now will allow us to be proud of the energy future we leave our children. 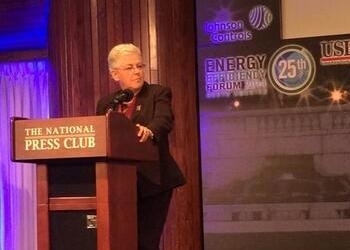 “We have a moral obligation—as people and, most of all, as parents—to make sure the world we leave our children has a safe and healthy environment and a vibrant and sustainable economy,” EPA Administrator Gina McCarthy stated in a recent speech at the Energy Efficiency Forum in Washington, DC. Reducing waste is a cause everybody can get behind, no matter their political affiliation, McCarthy noted. Framing the situation positively and considering her diverse audience has allowed her to emphasize efficiency as a viable path to the reduction of greenhouse gas (GHG) emissions. Electric power accounted for 38.1% of the United States’ energy consumption in 2012. Approximately 20% of that was renewable energy or nuclear electric power. The remaining 80% was the cause of nearly 100% of the CO2 emitted by the power sector that year. Administrator McCarthy has been a driving force behind the Clean Power Plan, a new set of proposed EPA standards aimed at achieving a 30% national GHG reduction from 2005 levels by 2030. The Clean Power Plan is a vital piece of President Obama’s Climate Action Plan. Released on June 2, 2014, the Clean Power Plan proposes to cut emissions from existing fossil fuel-fired power plants. Electric power generation is the single largest source of carbon dioxide pollution in the United States. The proposed Clean Power Plan utilized a radical new level of input from states and individuals. EPA individually tailored the plan according to each state’s existing infrastructure and future needs. The idea was to make the plan flexible because “there’s no one-size-fits-all solution. [States] can choose what’s best for them,” remarked McCarthy. The proposal will also focus on efficiency at each level of production, from plant to plug. EPA recognized states’ concerns, but McCarthy stated that the plan will not increase the cost of the energy supply. Administrator McCarthy continued by encouraging energy efficiency proponents to use common sense language when explaining what energy efficiency can do for people. Each voice can have a dramatic impact, she noted. It may be wise to avoid talking about climate change itself, depending on the audience, but it is very important to “stop talking about the dangers of climate change and start doing something about it,” according to McCarthy. Supporting energy efficiency by becoming actively involved at the community and state levels is an effective way to have a tangible impact.